GWS reader Lewis got a tattoo of the Batman symbol across his back a few weeks ago, and I’ve officially given up trying to understand the purpose of plastering a big, black trademark across your torso. (See here, here, and here.) I mean, I get it… but I don’t. Not that I don’t appreciate the wonderfully-batshit (no pun intended) fans who do this kind of stuff. Keep up the high-quality crazy, people! Daddy needs blog content. 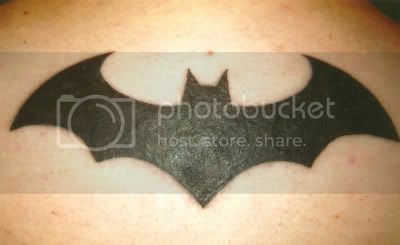 I had the Batman logo that’s been used for the last few years on my back. Not massive, but I think it’s a decent size. It’s about 5-6 inches at the top of my back, and sorry, don’t have another pic. I’m sorry you don’t have another pic, too, Lewis. Because, hey, it’s not like the ladies have been banging down the door after my last Adsense check and skin is skin, am I right? No. Not at all. So stop nodding your head. The only man with the power to turn me gay lost his chance when he took on the lead role in a formulaic CBS ABC show called Castle. Damn you, Fillion. It could have been beautiful. Hey, thats pretty good. And I’m not a tatoo fan. I don’t think that’s enough of a reason to give up on Fillion. I think you lack commitment, sir. i feel the need to point out that castle is on ABC not CBS. and nathan fillion can do whatever he wants in my book he’s yummy! yes, i said YUMMY. deal with it. And that’s one awesome tattoo. I dont get it, GWS. Don’t you have a similar corporate trademark permanently emblazoned on your skin as well? Or is there a maximum tattoo size threshold which Lewis crossed, that you find unacceptable? You’d go gay for Fillion? Really? Huh…he’s not even that cute. GWS, there’s one important thing to remember before pursuing Fillion: his fists are not the hammer. Or so I hear. From the people with the sexual orientation that is not mine.